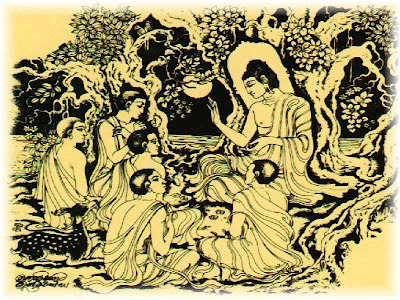 The Four Noble Truths is a specific teaching expounded by the Buddha Sakyamuni to the sravaka’s disciples, those who attain awakening by listening to the teachings of a Buddha. There is Suffering which rises based on Causes… The suffering can be Ceased… and the paths to lead to the Cessation. As I heard from the teachers explaining about, what is suffering? And I even search in many articles, books and talks and I came to conclusion on what suffering is that, Suffering which we normally take as some kind of grosser pain or unsatisfactoriness, like mental pain or physical pain, sickness, headache etc, but rather we are suffering everytime, although outterly we look fine but somehow every moment we are suffering, suffering of ‘Change’, ‘Uncertainty’, in every step or a level there is change and everything is uncertain and that is ‘Suffering’, as we use the most popular word in Buddhism is ‘Impermanence’, the suffering which we talk in Buddhism is utterly talking about the ‘Impermanence’, Impermanence of every compounded phenomena or things, as our life is Impermanence and time itself is Impermanence, therefore it is the Truth of ‘Suffering’. “Since all these defiling phenomena each moment are impermanent, painful, empty and devoid of self-entity, they are substanceless, unreliable and are therefore, taught as ‘the truth of suffering’.”as taught in the Pandita Syanayam Avataramukha Nama Shastrast by Mipham Rinpoche. There are two kinds of cessation, one is ‘Analytical cessation’ and second is ‘Unanalytical cessation’. “First, Analytical cessation, is the unconditioned quality of being permanently free from what should be relinquished, such as the disturbing emotions by means of the power of the path, such as discriminating knowledge in our heart. Four Noble Truths is not the philosophy of Theravada but it’s of the reality of beings and the world but precisely is taught in Theravada philosophy. More information will we added soon, its still under construction!